Timberland celebrated one million hours of community service this year with their 16th annual Earth Day Event which occurs in more than 100 locations in over 19 countries. We were one of the lucky recipients of this volunteer work here at Jackson Lab. Timberland came with 50 volunteers on May 15th and completed 6 projects. Not only did they work hard, Timberland donated funds to have our 4 Oyster Nursery Rafts completely rebuilt. The Nature Conservancy, NH Chapter also donated funds for lumber for the rafts. Tasks included; oyster nursery raft rebuild, washing recycled oyster shell for our remote setting process, water sealing our docks, painting the 2000lb crane and tank covers, building flower boxes, edging and planting shrubs and flowers around the lab. Luckily the rain held out! Coastal Research Volunteers - 7 years of expertise! 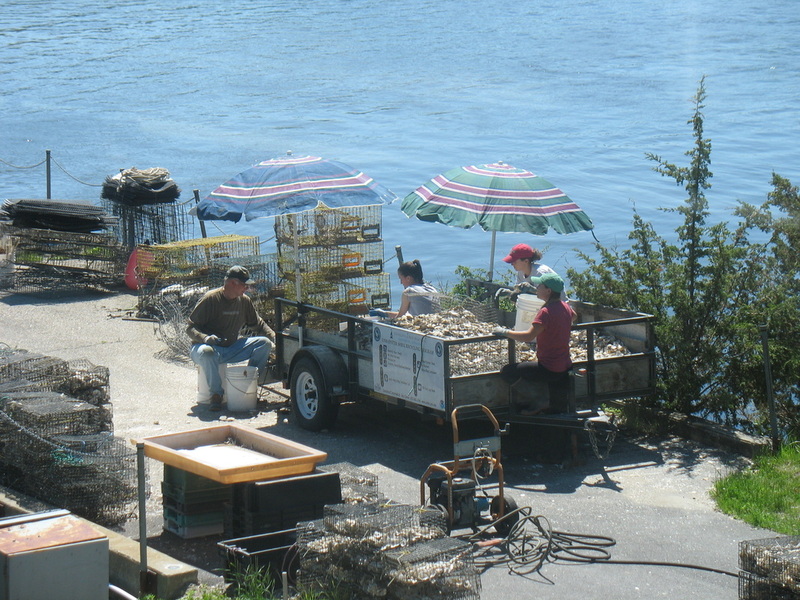 Over the past 7 years, CRV members have been involved in washing recycled oyster shell for our remote setting process as well as monitoring the oysters spat on the nursery raft for the summer months before the spat-on-shell is transferred to a carefully selected restoration sites in the Bay. They are knowledgeable citizen scientists, many with a background in biological sciences.